For work related reasons I have a number of trips to Germany for the next few weeks/months. Alsongside blog entries for cutepdf or and pdfcreator this blog shows the way to include the Barcode Writer in Pure Postscript (from now referred to as BWIPP) with PDF24. Download the BWIPP from the download section "Seperate file per named resource" as this is required for the ghostscript resource process. The current PDF24 2.9.5 version comes with ghostscript version 8.61. Copy the BWIPP to the PDF24 ghostscript related resource directory. As shown here. Now all the barcodes from the BWIPP can be used to generate pdfs with barcodes. 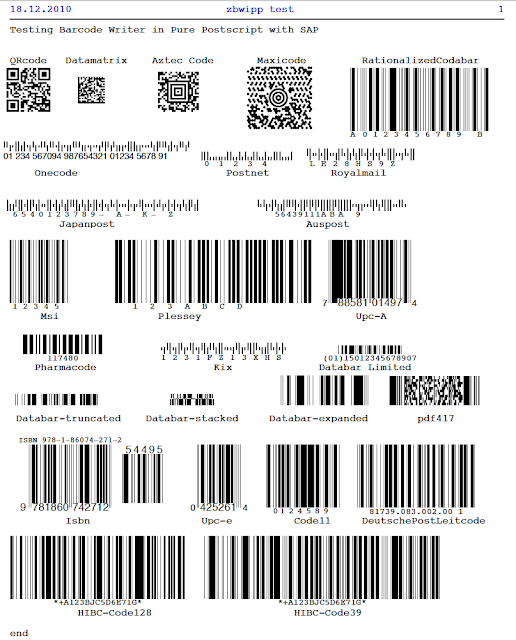 An example 26 barcode page generated with SAP. An alternate approach of including the BWIPP in an SAP device type and using cutepdf is demonstrated in the youtube video below.